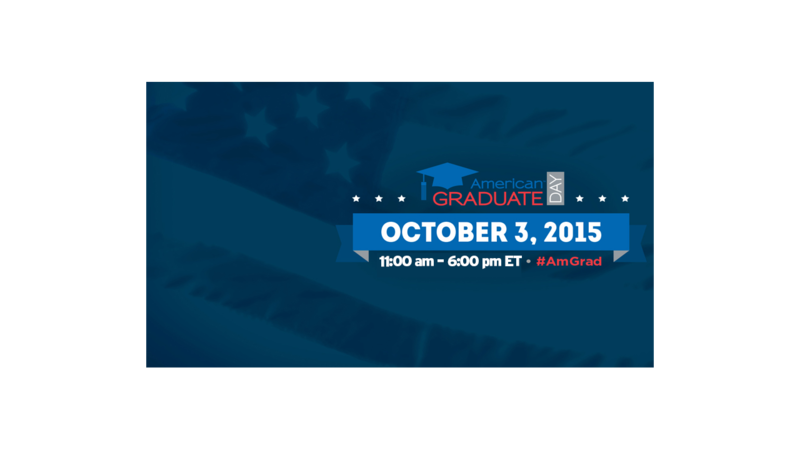 American Graduate Day will return on Saturday, October 3, 2015 from 11 a.m.-6 p.m. EDT. American Graduate Day is a live, seven-hour multiplatform broadcast that leverages the power and reach of public media to focus on those organizations and individual Champions keeping kids on the path to graduation. American Graduate Day centers around the critical themes of: Career Readiness and College Completion, Caring Consistent Adults, Dropout Prevention and Re-engagement, Early Education, More and Better Learning, Special Needs, and STEAM. Journalists, thought leaders, and celebrities join together to raise awareness of the incredible work being done across the country to keep kids in school. The broadcast and online event features a mix of national and local segments from across the country that showcase how community organizations and individual Champions provide support, advice, and intervention services to at-risk students, families, and schools. Throughout the day, viewers are invited to engage with their local public television stations and the featured community organizations. Viewers can participate in the event by asking questions and sharing ideas before and during the broadcast on Twitter and Facebook, using the hashtag #AmGrad.